Spring is just arriving on the mountain top. Snow still sits on hillsides where the sun does not directly shine, but the meadows and open places are free of snow and the early spring flowers are starting to bloom. They are not abundant yet, but with a careful eye, tiny treasures can be found. 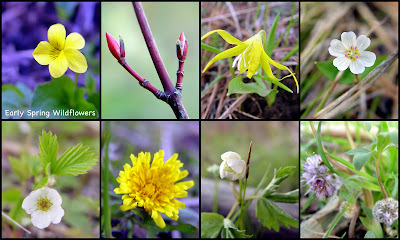 A yellow violet, a dandelion, and strawberry blossoms can be found in small clusters. The dog-tooth violets are pretty as they show their yellow faces all around. Early spring wildflowers show their beautiful faces and bring joy to all around! Looking pretty on your mountain top! So nice to look over the past few posts. Loved to see the home ec picture...hope that you'll let your teacher know, if you can, how much she influenced you. I'm wondering which young lady is you. Your mountain flowers are so delicate and lovely. The delight taken in each one is beautiful. They are a treasure when blossoms are so rare. I love the wildflowers on the mountains of Oregon! Thanks for sharing yours with us. Oh so pretty! Thanks for bringing me joy by your wonderful photos! Beautiful. It's so good to take the time to see these beauties! Love, love wildflowers. What a treasure you have on your mountain top.